Sheezlebub has a great post on the October 1975 Icelandic Women's Strike. The Rose City Rollers were born in August 2004, when Portland skaters Kim Stegeman and Jeffrey Wonderful sat around a bar in Southeast Portland discussing the recently revived sport. After a few nights of increasing enthusiasm, the pair began researching the movement online, seeing what leagues like the Texas Rollergirls were up to, and brushing up on how the game was played. A small group began to skate at Mount Scott Community Center, learning the ropes as they went along. Novice skaters would ask Stegeman and Wonderful questions about rules and techniques, and the two of them would improvise answers while becoming more absorbed in the game through online forums and talking to women who skated in derbies years ago. The learning curve was steep, as the Rollers quickly became organized and began to register team names and look for a permanent home. (The search for a RCR headquarters proved to be exceptionally difficult, given the growing property values in Portland. The league still has no dedicated space to call home, hold practices, or host competitions—they don't even have lockers.) The Rollers briefly practiced in the basement of SE bowling alley Grand Central Bowl, and were homeless for several months before landing their part-time practice space at the Armory. The number of girls who signed up over time grew wildly—Stegeman claims there have been hundreds—though most don't stick around for the long haul. Roller derby is an aggressive sport—girls have been injured at nearly every practice I've attended. The cement floor of the Armory is an unforgiving surface, and the game lends itself to sprained ankles, torn ligaments, and the occasional broken bone. Last Monday's practice found the Rollers more high-strung than I had ever seen them. It was one of the last practices before their first public bout at the Portland Expo Center this Saturday, October 22. This is what the girls have been working toward for the past three years; although they've made public appearances here and there, nobody has seen what the Rose City Rollers can do. The teams, many geared up in their uniforms for the first time, nervously huddled around as they worked on their entrances, which find the girls skating in a complex, multi-directional blur of helmets, tattoos, and dreadlocks to the Rose City Rollers' punk theme song. Portland Expo Center, Hall C.
"Probably Todd saw the writing on the wall and the Republican establishment, my assumption is, moved in and said, 'Mr. Baxter, you're not going to win this race and so let's put somebody in there that doesn't have the baggage you have,' " said Chris Elliott, chairman of the Travis County Democratic Party. "But any candidate they put in there, Ben Bentzin or whoever else, is going to be a product of the same Republican establishment that has been inept in the way they run this state." Senior US military officials launched an investigation today into claims that US soldiers desecrated the bodies of Taliban fighters in Afghanistan as part of a propaganda campaign. Australian investigative news programme Dateline broadcast a film which appeared to show US soldiers burning the bodies of two fighters and using their charred and smoking corpses as a taunt to nearby Islamic militants. More than one in four U.S. troops have come home from the Iraq war with health problems that require medical or mental health treatment, according to the Pentagon's first detailed screening of servicemembers leaving a war zone. In the year before Refco sold shares to the public and then promptly made the fourth-largest bankruptcy filing in United States history, insiders at the firm received more than $1 billion in cash, according to the firm's financial statements. And one insider, Robert Trosten, received $45 million when he left his post as chief financial officer a year ago, according to testimony at an arbitration hearing earlier this year. UN emergency relief chief, Jan Egeland, said the organisation had never seen such a "logistical nightmare". A 23-year-old woman who said she was hearing voices stripped her three small children naked Wednesday and threw them off a San Francisco fishing pier into the bay, authorities said. Diners and strollers watched in horror as rescuers raced against an ebb tide to search for the children in the murky waters off Pier 7. After five hours, the body of a small child was pulled from the bay near Fort Mason. Minutes later, police booked the mother of the children, Lashaun Harris of Oakland, on three counts of murder. Dan Simpson - U.S. forces have started fighting Syrians at Iraq's border. Condi testifying before the Senate Foreign Relations Committee today. Lawmakers also pressed Rice on strategy for dealing with Iran and Syria. U.S. officials have accused Syria of allowing foreign fighters to flow across its borders into Iraq and Iran of supporting the insurgency. Rice said the United States was using diplomatic means to urge a change in the behavior of both countries — but she stopped short of ruling out military force. "I'm not going to get into what the president's options might be," Rice said. "I don't think the president ever takes any of his options off the table concerning anything to do with military force." Experts Warn of "Peak Pony"
WASHINGTON (Reuters) - Republicans have had it tough over the last few weeks, with President Bush approval ratings below 40%, the indictment of House Majority Leader Tom DeLay on conspiracy and money laundering charges, and the expected indictment of several senior White House officials for blowing the cover of a CIA operative. Republican woes have been a boon for the pony markets, which have seen prices soar to historic highs due to increased demand from ecstatic liberals. This spike in demand has led many experts to warn of a near-term pony shortage, and led to fears that the world may be approaching “Peak Pony”, the point at which nations are no longer able to meet their vital pony needs. For most of the 20th century, ponies were primarily used as imaginary companions for giggling pre-teen girls. However, the market base for ponies has expanded considerably in recent weeks and months, as liberal euphoria has reached such giddy heights that only brightly-colored, silken-maned, magical sparkly friendly talking flying ponies are capable of expressing. 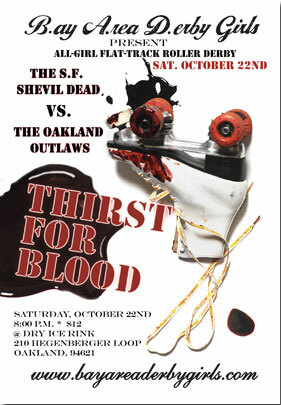 The flat track Bay Area Derby Girls will skate their first bout this Saturday, October 22nd. New Mexico's flat track league the Duke City Derby will have their first exhibition bout this Saturday, October 22nd. Tickets are $5 for those over 12. 12 and under are free. See the Duke City Derby website for more info. 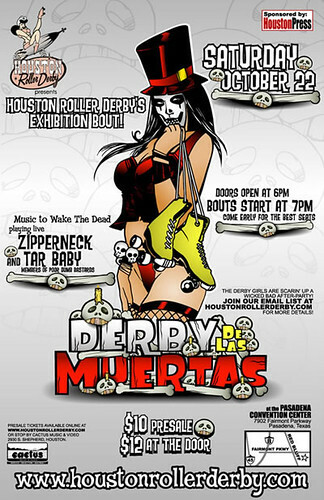 The new flat track Houston Roller Derby will skate an exhibition bout this Saturday, October 22nd. Ticktes are $10 in advance, $12 at the door. Please visit the Houston Roller Derby website for more info. 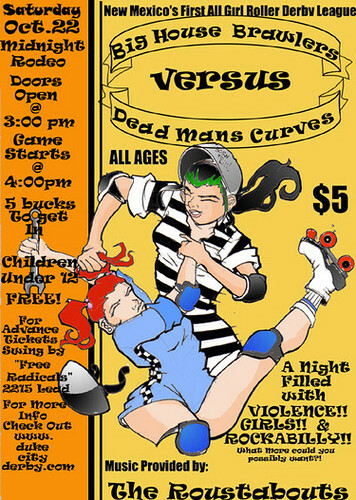 The new flat track league Sin City Rollergirls will skate an exhibition bout this Saturday, October 22nd against a team from Arizona Roller Derby. A $5 donation is suggested for track side seats. Visit the Sin City Rollergirls website for more info. The flat track Gotham Girls Roller Derby will skate their Championship Bout this Friday, October 21st. Skate Key, 220 E. 138th Street in the Bronx. Tickets are $12 in advance. VIP tickets are sold out. Doors open at 7:30pm, bout at 8:30pm. Visit the Gotham Girls Roller Derby website for more info.